Turmeric extract is standardized to 95% curcuminoids, a potent antioxidant. Turmeric is a popular spice used in curry dishes. Turmeric provides antioxidants for the maintenance of good health. Directions: Adults take one tablet per day. Other Ingredients: Microcrystalline cellulose, maltodextrin, stearic acid, silica, modified cellulose, glycerin. Caution: Consult a health care practitioner prior to use if you are pregnant or breast-feeding, have gallstones or a bile duct obstruction, stomach ulcers, excess stomach acid, or if you are taking antiplatelet medication or blood thinners. If symptoms persist or worsen, consult a health care practitioner. This product is amazing. It has so many benefits. My most favorite is that it brings down inflammation in my body. 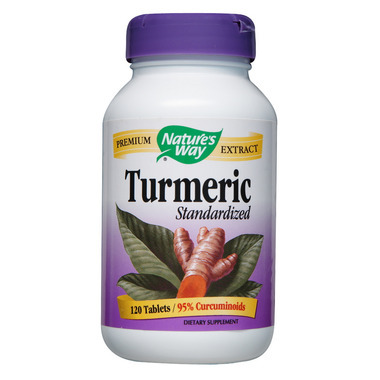 When I take this regularly, My joints throughout my body do not hurt and my migraines has disappeared since taking turmeric.